Yesterday [Feb 23] Keep Bermuda Beautiful [KBB] together with volunteers from local businesses cleaned up the stretch of canal along Mills Creek Road removing litter and packing materials from the water, mangroves and roadsides. “Earlier in February, KBB organised a stakeholders meeting with local businesses to discuss the challenges of litter and packing materials on the loose and how easily they can become roadside litter and work their way into the canal. “Once in the canal these materials can clog the sluice gate and impact the water flow which contributes to flooding in the area. Our goal is to start a discussion, provide assistance, and encourage local businesses to get involved in the cleanup process.” Explained Anne Hyde. KBB is tackling the canal section by section starting at the Mills Creek end and heading east. The charity looks forward to working with stakeholders located further along the canal and will be making contact with them in the coming months. Business owners who have shops, warehouses or yards along the canal can contact Anne Hyde directly at KBB to get involved on 295 5142 or kbb@northrock.bm. On Saturday employees from Mills Creek Road businesses came out to help including Tops, Bermuda Forwarders and Orange Bay Company. They cleared away packing materials, predominately Styrofoam packaging and plastic sheeting, together with disposable take-out containers and pieces of lumber that had been discarded along the canal and become embedded in the sluice gate and surrounding mangroves. Bermuda Forwarders was one of the first companies to start doing business in the canal area back in the late 1960s. Volunteers reported that back then there was none of the trash and flooding that the area experiences today. TOPS Ltd. has been located in the Mills Creek Road since 2002. Vice President Ed Faries said, “Tops recognises that our operations impact the environment and we have adopted several environmentally friendly practices including using a cage for sorting and containing all of the packing materials that might blow away. TOPS environmental efforts were acknowledged recently when the company received the 2012 Greenrock Green Workplace Award in the Owner-Occupier category. 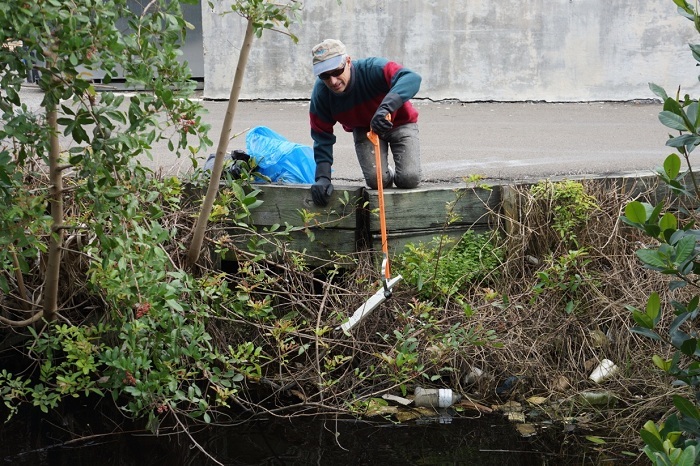 In addition to the canal cleanup, KBB supported three other community cleanups yesterday. 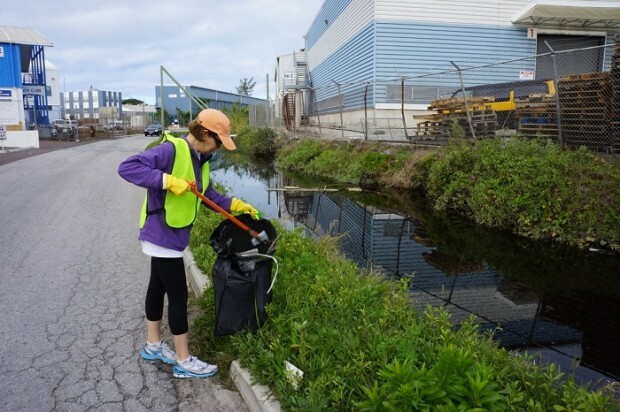 As part of KBB’s ongoing Community Cleanup Programme two neighbourhood watch groups completed cleanups. The first was the Devonshire Lions in the Dock Hill and Roberts Avenue area and the second was the Cameron Close Neighbourhood Watch Group in Smiths who cleaned up the Penhurst Park area on North Shore. 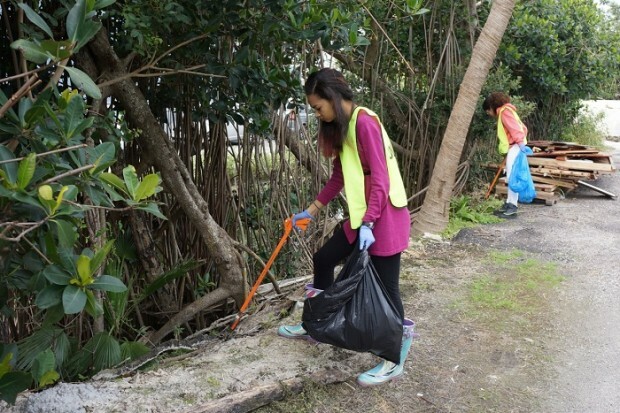 The third cleanup took place at Admiralty House where a group of volunteers from Couples for Christ have adopted the area as part of KBB’s recently launched Adopt-a-Spot Programme. Keep Bermuda Beautiful’s AGM and Appreciation Awards reception takes place on Tuesday 26 February at 6pm in the Botanical Gardens Visitor Centre. All are welcome to learn more about KBB’s activities and become members. A big thank-you for everyone who came out and contributed in this terrific effort!